Embroidery Library has drawn and digitized more than 100,000 designs, and the designs range from very simple to realistic and complex. Our floral and wildlife designs are especially photorealistic. Those types of designs have shading and highlighting to create beautiful detail and dimension. Complex designs oftentimes have a high stitch count and a high number of color changes, too. When working on a project with a complex design, follow these tips and guidelines to get excellent results. This Bald Eagle design is considered "realistic." Several shades of brown are used in the feathers to mimic the effect of sun and shadows on the eagle. The feathers are composed of satin stitches, and you can see that they are smooth and sleek. Satin stitches are more dense than other types of stitches. It takes more satin stitches to cover an area of fabric than other types of stitches. This is considered a "complex" design. 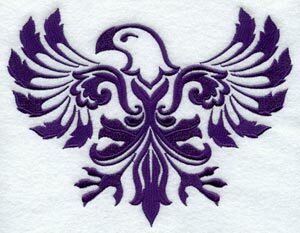 This damask eagle is much simpler than the eagle to the left. It's stylized, not realistic, so doesn't have shading, highlighting, or blending. There's more negative space and open areas in the design. And, the design uses only one color thread. This is considered a "simple" design. 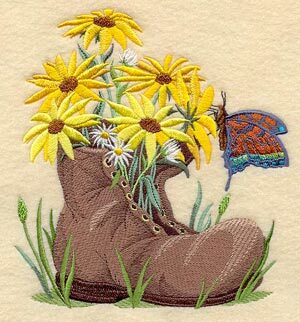 This daisy design, called "Blooms in a Boot," has shading on the boot. Note the different shades of brown that are used to demonstrate that the boot is old and weathered. The flowers are composed of satin stitches (again, those will have higher density), and there's teeny-tiny detail in the wings of the butterfly. This is considered a "complex" design. This design is a simple daisy. There's no fancy highlighting or color-on-color work here. The fills are solid, but simple. 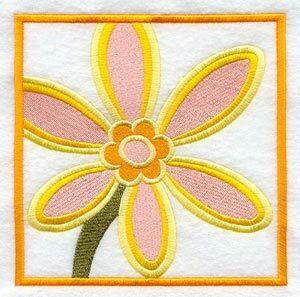 Satin stitches are delicate around the petals, and the border. - Use a sturdy fabric; denim, canvas, linen, chamois, corduroy, flannel, and home decor fabrics are all considered "sturdy." Sturdy fabrics provide a good foundation for designs that have high stitch counts. - Use one piece of medium-weight cutaway stabilizer. Complex designs have a high stitch count, and tear-away stabilizer will not work well. The needle perforations disintegrate the stabilizer, leaving nothing behind to support the fabric. Some embroiderers are tempted to use multiple pieces of stabilizer when working with complex designs. However, using multiple pieces of stabilizer dulls the needle faster, resulting in larger holes in the fabric, fuzzy stitches, and numerous thread breaks. One piece of stabilizer is sufficient. - Use a sharp needle (not an embroidery needle). Complex designs often use layering of thread colors. A small, sharp sewing needle will do a great job when your machine is stitching one color over another. An embroidery needle has a rounded tip, and doesn't work as well. - Hoop the fabric with the stabilizer tightly. Using a spray adhesive in-between fabric and stabilizer works very well to keep a tight bond. Also, review these Perfect Hooping tips -- especially the one about using rubberized shelf liner to get an extra-good grip! - Do not resize the design. 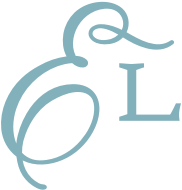 Resizing designs on a machine or with an embroidery editing program can cause other problems, such as altered fills, gapping, and "muddy" features. 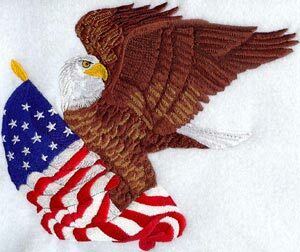 - For more details, the tutorial Embroidering Complex Designs expands further on the above concepts.